To save leaving mistletoe seed germination to chance, you can improve your germination rates by following these six tips for successfully growing mistletoe from seed. 1. 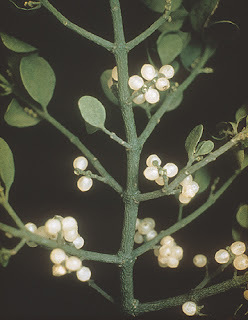 The best time to propagate mistletoe is from March to April when the seed is fully ripe. Try to obtain seed from a host plant similar to the one you want to propagate onto as this gives the best chance of germination. 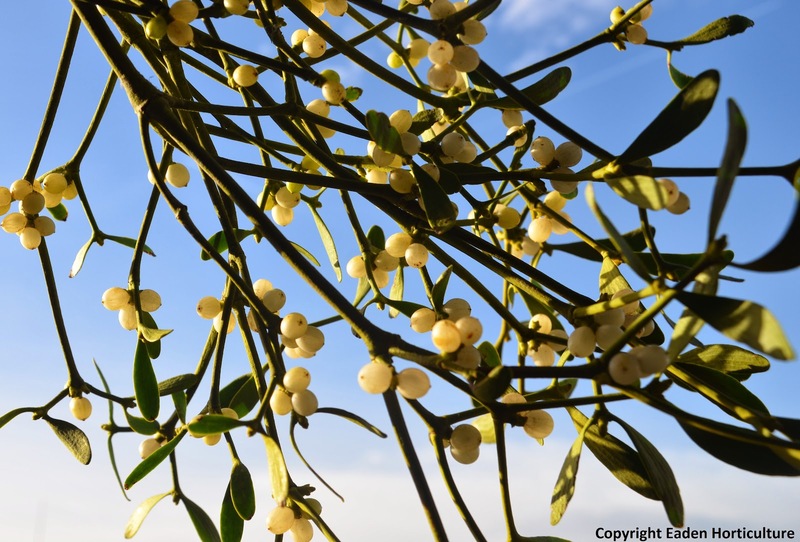 If you are obtaining your seed from shop bought mistletoe the chances are that they have been imported in from French apple groves located in Normandy and Brittany. If the berries have been stored then re-hydrate them for a few hours in a little water. Whether they are fresh or stored, the seed will need to be squeezed out of the berry, along with a quantity of its sticky , viscous flesh, known as viscin. 2. Harvest intact berries only, because if the berry skin ruptures the contents inside will harden hindering germination. Unfortunately germination rates for mistletoe seed can be quite low as only about 10% of their seeds survive to becoming a mature plant. With this in mind it's advisable to propagate at least twenty seeds, as when mature, mistletoe will require both male and female plants to produce berries. 3. When choosing your host tree bare in mind the mistletoe references – apples are first, then poplars, limes, false acacia, and then hawthorn. Occasionally they have been known to grow on oak. 4. Select a branch 10cm (4in) or more in girth, preferably on a tree at least 15 years old. If possible sow seeds in the crooks of the higher branches so that sufficient light can reach the seedlings as they grow. Mark each berry with some coloured string to identify where they have been positioned. Alternatively make shallow cuts into the bark, remove the seed coats from the seeds, and insert them under the bark flaps. Cover the flaps with hessian and secure the bark back in place with twine protecting the seed from birds. 5. Germination is fairly rapid and a short green hypocotyl (a growing tip which bears the embryonic leaves) should appear and bend to make contact with the host bark. At this stage these tiny plants are particularly susceptible to grazing invertebrates and birds. They are also prone to dehydration until their roots have connected with the host's vascular system. If all goes well the hypocotyl will remain unchanged until the following February. Only then will a small new plant appear. 6. As the mistletoe develops the host branch will begin to swell in girth. Growth of this juvenile plant will remain slow taking five years to reach berrying-size. If either all male, or all female plants develop you can attach more seeds the mistletoe parent plant. 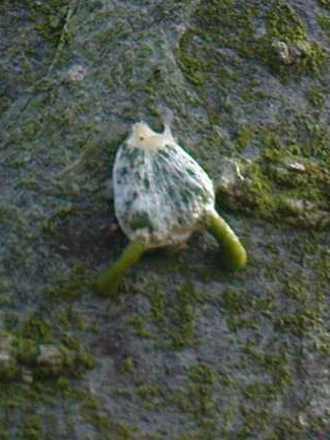 Strangely mistletoe will readily act as a host to its own parasitic seed.